In 2012, we reorganized and changed our name, but the owners remain the same. We will continue to offer a limited number of weaned babies. We will also continue to be dedicated to our new flock, conservation work, and dealing with legislative matters. To our valued customers, thank you for your support over the many years. 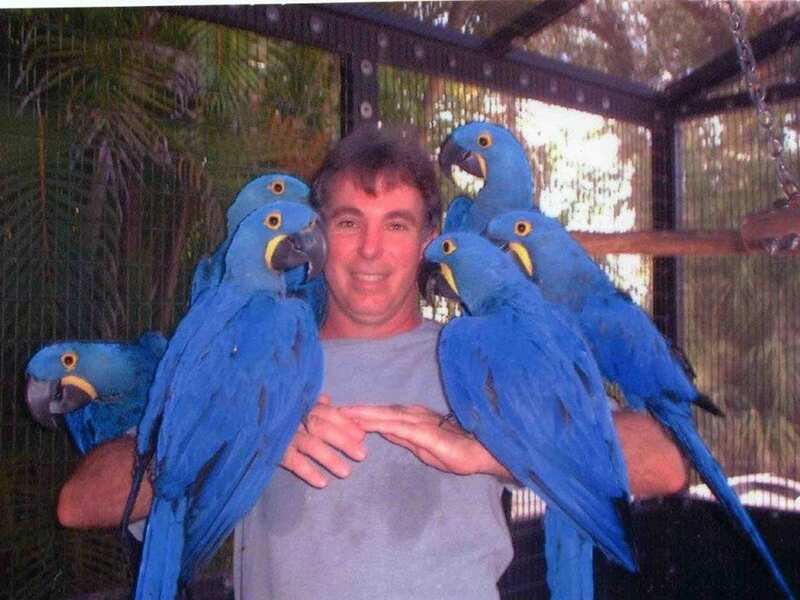 Hyacinth Macaw Aviary, Inc. is located in tropical south Florida, and is owned and operated by 3rd generation aviculturists Joe and Terri. 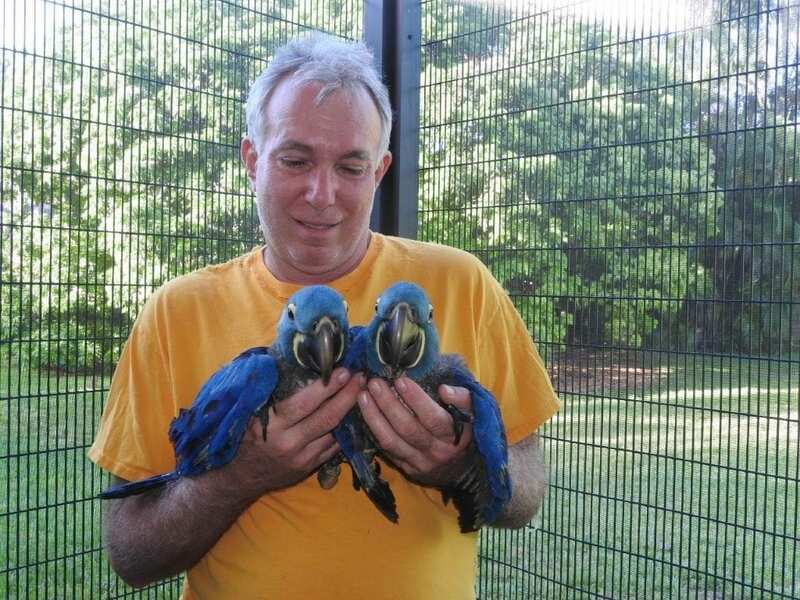 It was originally established in 1993 and has specialized in the care and breeding of Hyacinth Macaws (Anodorhynchus Hyacinthinus), and has successfully bred 4th generation offspring. The business started as a hobby over 25 years ago when 2 opposite sexed Hyacinth’s were acquired from separate owners, introduced, and handled as pets. A strong bond established between them and after several months, a temporary 6ft x 6ft x15ft cage was set up in the garage, while a more permanent structure was being built to better accommodate them. Once put into their temporary cage, they began to lay eggs on the floor in less than a month. A 24in x 24in x 48in nest box was quickly built, and 9 babies out of 12 eggs were hatched in the next 12 month period. The pair actually remained friendly (especially the female), and would interact with Joe when he went into their cage, even while the hen was sitting eggs. After leaving the first clutch of 3 eggs with the parents, and having had all 3 babies die in the shell, learning about the process of artificial incubation seemed imperative. Unfortunately, 2 of the next 9 babies later died due to genetic, nutritional, and husbandry issues, however, the experience helped to bring about vast improvements in the way future babies were reared. After a year of laying eggs, the pair was brought into the house, as pets again, to give them a break from breeding. 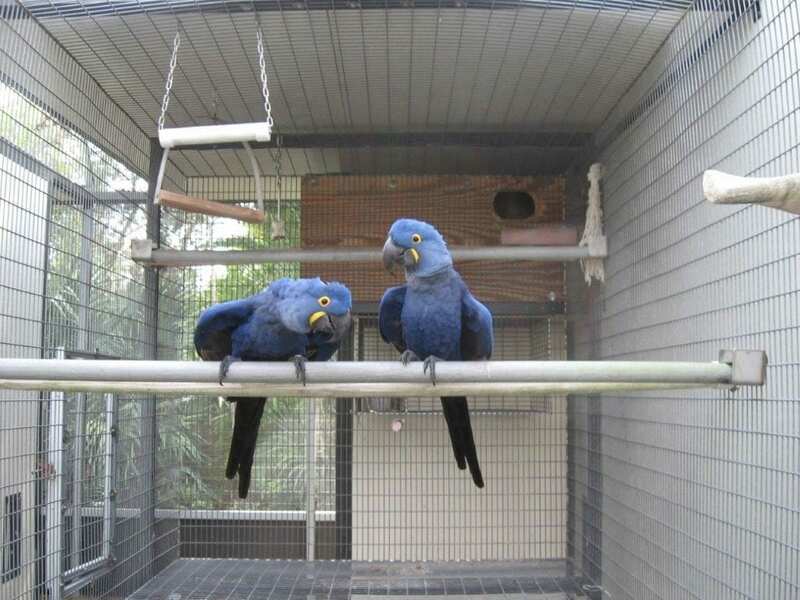 After several months they were introduced into their new breeder cage, where they became more hostile, probably because they became aware that their eggs were being swapped with blanks. For the first several seasons, it was necessary to bring them in for 3 or 4 months each year, to break the breeding cycle, otherwise the hen would continue to lay eggs. They would actually regress into the pet mode every time they were brought back indoors. Eventually she settled in to seasonal egg production. Other pairs were later acquired from the proceeds of those babies, home refinancing, and liquidation of other assets, thus starting the growth of the company. From that humble beginning to the present, over 600 Hyacinth babies, up to 4th generation, have been brought into this world. Though much has changed through the learning process, the entire operation is still run by the original 2 owners. Some of the success can be attributed to DNA genotyping, nutritional analysis, control group studies, comparative analysis, quality veterinary guidance, countless hours of dedication and hard work, as well as being blessed from above. 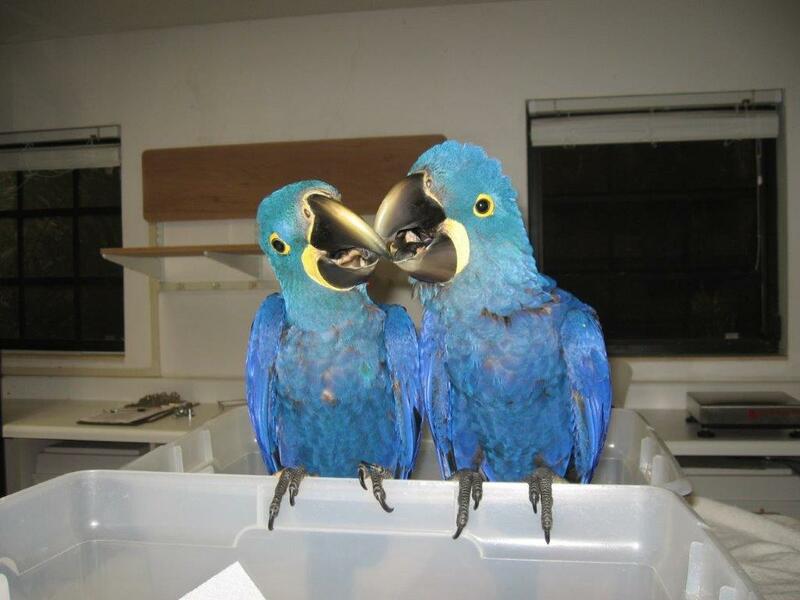 We Support The Hyacinth Macaw Project Through Parrots International. You can too! Your help is greatly needed and appreciated. Please help the program with your contribution. 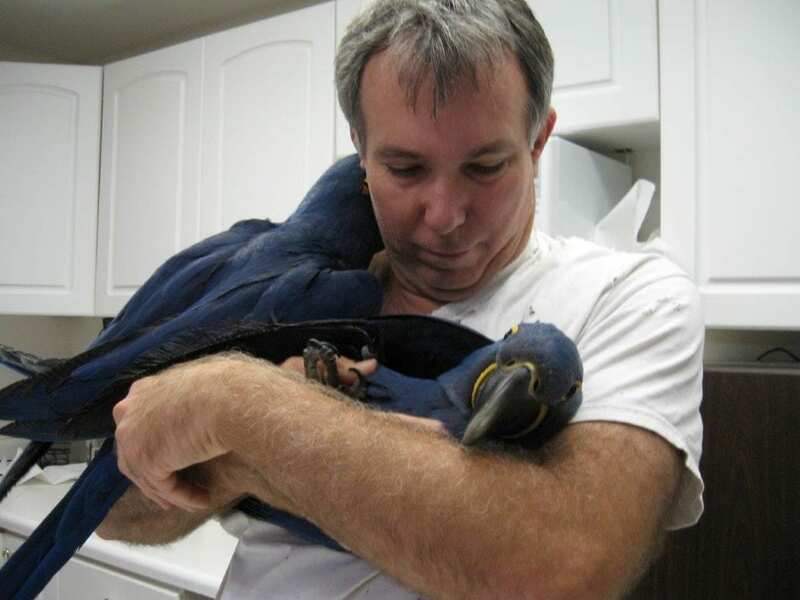 100% of your tax deductible donation will go to wild Hyacinth Macaw conservation efforts. 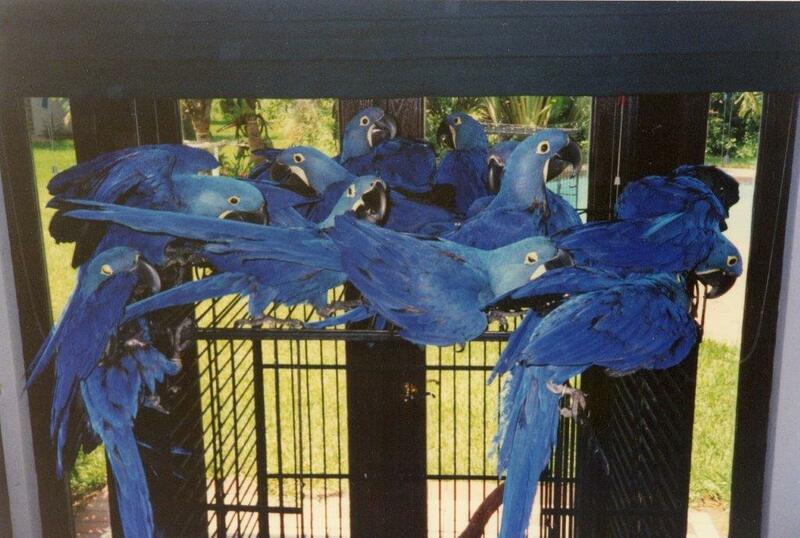 © 2018 Hyacinth Macaw Aviary Inc.